Turner Prize-winner Jeremy Deller and Fourth Plinth artist Yinka Shonibare MBE have pledged their support for a-n/AIR’s Paying Artists campaign in statements that urge all publicly-funded galleries to pay fair fees to artists. Deller, who represented Britain at the 2013 Venice Biennale, has pledged his support in a statement that draws on his own experience as an artist and stresses the importance of “proper and fair payment” for those exhibiting in publicly-funded galleries. He said: “Our vibrant visual arts culture is built on diversity and social mobility – on the premise that young people from all walks of life can gain access to art school and go on to become the artists of the future. It is wrong therefore that some publicly-funded galleries expect artists to exhibit work for free, because without paid opportunities, only those with a private income will be able to afford to make art in the future. Yinka Shonibare MBE, who created the famous ‘Nelson’s Ship in a Bottle’ Fourth Plinth commission in 2010 and has exhibited at major museums and galleries across the world, has pledged his support in a statement that stresses that without fair payment the arts is at risk of becoming elitist. He said: “The Paying Artists Campaign is important for the future of contemporary visual arts. We won’t have great artists making significant work in the years to come if we don’t tackle the problem of low or no pay. I raised this issue publicly when the Arts Council announced plans ten years ago to improve funding levels to contemporary visual arts – I asked how can artists afford to live in places like London if they don’t get paid for their contributions to galleries? 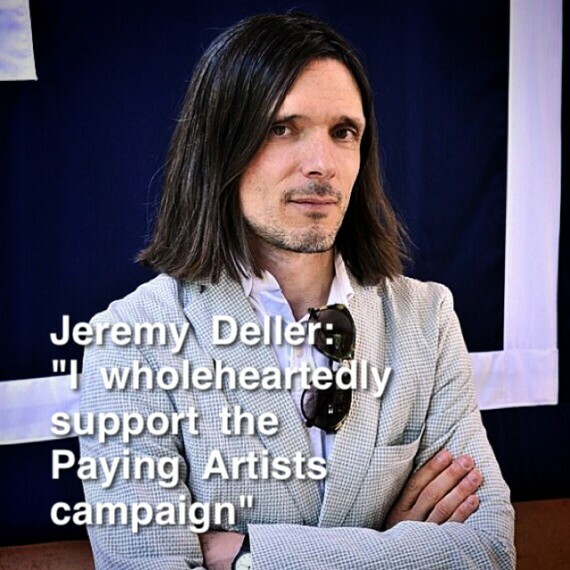 Speaking in response to Deller’s support, AIR Council’s Joseph Young said: “I first met Jeremy after a talk he gave at Brighton Festival in May, when I approached him to ask for his support for the Paying Artists campaign. What struck me was his eloquence and thoughtfulness as a public speaker (as well as his understated humour).